Tolcap enables Designers to predict the process capability of parts even before prototype samples are produced. Tolcap predicts Cpk - but what is Cpk, and is it the most appropriate process capability index to predict? The simplest process capability index: Cp. Recall Control Charts. To set up a control chart for a dimension on a part the dimension is measured on a sample batch of the parts. 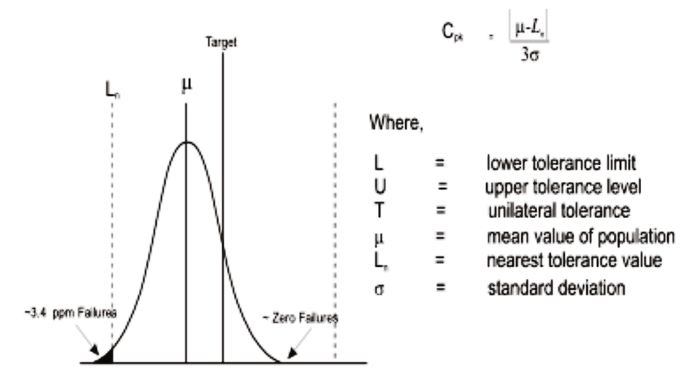 The mean (average) and standard deviation, or “sigma” of the measurements are calculated. The action limits on the Control Chart are then conventionally set at plus and minus three sigma from the mean. 1) Turning & Boring. For each batch or production run, a setter installs and adjusts the cutting tools to produce the required dimension. There is a limit to the precision the setter can achieve in centring the distribution of the parts around the nominal dimension between the limits. 2) Plastic Injection Moulding. As the tool is used it will wear. The toolmaker will make the tool with this in mind: splines on the tool that produce grooves in the part will wear away and the grooves in the part will get smaller as the tool wears - and vice versa. So the toolmaker makes the splines on the tool oversize to start, to maximise tool life. Of course if the mean actually does coincide with the centre of the distribution, then Cpk = Cp, but in general it is smaller. In Process Capability (Cp, Cpk) and Process Performance (Pp, Ppk). The formulae for Cpk and Ppk are exactly the same, but the difference is how sigma is calculated. For Ppk, data is collected for the whole history of the part, whereas for Cpk provides a “snapshot” using data from one batch or run of the process. So as a designer, which would you like to know in advance: Cpk or Ppk? Well obviously both of them! OK, which is more useful? Design for Six Sigma recognises process shift - and also tells us that variation (sigma) is what we have to ensure we have in control, because there is usually something we can do about process shift. Going back to the Turning and Boring example, if the average dimension is too small, we call the setter back. In the case of Injection Moulding, we call in the toolmaker to adjust or refurbish the die - or eventually we find and accept it’s time to replace the tooling. That 1.5σ process shift by the way comes from the idea of maybe having to keep a control chart to monitor process shift: The action limits on the mean on an Xbar-R chart with four samples come out at +/- 1.5σ. So on this basis, Tolcap predicts Cpk rather than Ppk. Tolcap acknowledges the Process design of the Ford PPAP (Pre-production Part Approval) process. Ford require suppliers to ensure their parts will prove process capable in series production at Cpk=1.33. That is why Tolcap’s default acceptable Cpk target is 1.33. In support of this requirement, Ford requires suppliers to demonstrate Ppk=1.67 on the final pre-production parts manufactured on the production line process. Ppk? It is perhaps easy to dodge an explanation by saying that here “P” stands for “Preliminary”, but is it actually Process Performance they mean? If the pre-production parts are all from one batch, it makes no difference: the batch is the entire history anyway. But there may be different batches. In this case it doesn’t seem unreasonable that the supplier demonstrates the process will consistently be well within limits, even if the mean has to be re-adjusted, and there is a margin to allow for variation of materials and conditions once full scale production is under way.